With the S&P 500 hitting a new bull market high (on a closing basis) in the last week, it shouldn’t be too much of a surprise that bullish sentiment on the part of individual investors rose to its highest level since last February. 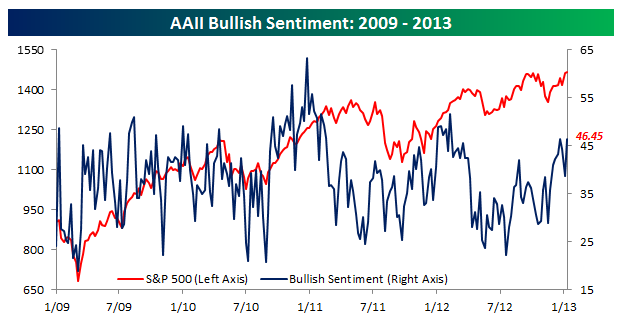 After a sharp pullback the week before, the weekly poll of bullish sentiment from the American Association of Individual Investors (AAII) rose from 38.71% up to 46.45%. Even though bullish sentiment is at an eleven month high, one would think that with the S&P 500 at a five year high, it would have at least been able to cross the 50% threshold.